Explore basic concepts of modern day ocular surgery. Addresses complicated cases and developing technology. Discussing the latest surgical tips, techniques and pearls. “The Premium Channel” covers all aspects of premium eye care from new surgical technologies and advanced IOL options to pharmaceutical breakthroughs and novel patient interaction techniques. 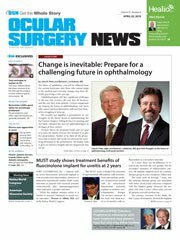 This column will present clinically relevant information, insights and techniques that we as clinicians can apply to our daily practice of ophthalmology. John A. Hovanesian, MD, FACS, focuses his blog on new technologies and innovations and how ophthalmic practices can best incorporate them to benefit patients. BLOG: Impending doom? What should your practice do now? Priya Narang, MS, focuses her blog on complex cataract surgery cases, new techniques and innovations, along with unique case reports. Shareef Mahdavi helps doctors be smarter when it comes to their practice. His blog covers financial, customer and technology topics. Dr. Gupta’s blog is designed to cover the latest innovations in ocular surface and MGD diagnosis and treatment from a practical, clinical perspective. Topics will range from dry eye demographics to treatment pearls and workflow tips and tricks, all focusing on real-world implementation of techniques and technologies. George O. Waring IV, MD, FACS’s, “Presbyopia’s Coming of Age” blog focuses on surgical and technological innovations in presbyopia correction. Waring is founder and medical director of Waring Vision Institute in Mt. Pleasant, South Carolina. David Khorram, MD, focuses his blog on global ophthalmology and issues related to combating global blindness. Elizabeth Yeu, MD, focuses her blog on best practices for comanaging patients with optometrists. Based in the belief that diverse leadership results in better outcomes – for practices, organizations and the industry as a whole – Ophthalmic World Leaders (OWL) works across ophthalmology to provide professional and personal development and opportunities for collaboration. In this blog, OWL members share insights on building the skill sets and confidence required of today’s ophthalmic leaders. Melissa Toyos, MD, focuses her blog on glaucoma treatment tips and hot topics. John B. Pinto, Practice Consultant and OSN Section Editor, focuses his blog on ophthalmic strategic planning, economics and benchmarking, marketing, cost containment, revenue enhancement, physician leadership and personnel/physician career development issues. Robert Noecker, MD, MBA, focuses his blog on the positive impact diagnostics and imaging have on various disease states and conditions. Ashvin Agarwal, MD, focuses his blog on interesting cases and experiences he encounters as an anterior segment surgeon. Savak "Sev" Teymoorian, MD, MBA, focuses his blog on the latest glaucoma medications, treatment strategies and surgical advances. Arun C. Gulani, MD, MS, focuses his blog on custom designed approaches to complex cases using practical surgical techniques. Helgi David Björnsson, MD, a YO member of the OSN Europe Edition Board, focuses his blog on online resources for learning and sharing information and ideas in ophthalmology. Each month, one website or other digital resource will be presented and explored in depth. Soosan Jacob, MS, FRCOphth, focuses her video blog on the most challenging ophthalmic surgical cases. Luigi Di Rosa, MD, a YO member of the OSN Europe Edition Board, focuses his blog on gadgets, bizarre inventions, apps, hardware and software that may be the brilliant solution to an awkward problem, the simple answer to a long-standing question, the trick that makes all the difference. Useful to the young specialist as well as the trainee and the consultant. Most practices, when they falter, do so because of a gap in administrative leadership. Corinne Z. Wohl, MHSA, COE, focuses her blog “Tuning Up Your Administrator … Tuning Up Your Practice” on ways to help your entire administrative team take their game to the next level as the ophthalmic business environment is becoming more challenging. Uday Devgan, MD, focuses his blog on premium-channel IOLs, including accommodating, multifocal, toric, and other innovative designs. Current techniques, research, trials, issues, and case studies will be presented with an emphasis on surgical and clinical pearls for maximizing patient results. BLOG: What can the state of medicine in Iceland teach us? In her video blog series, "Bridging the reimbursement gap," Cynthia A. Matossian, MD, discusses adding ancillary services and products to increase revenue in a private practice.